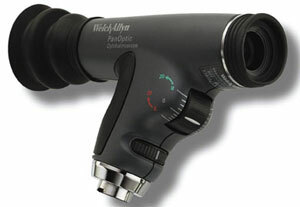 Welch Allyn introduces the PanOptic™ Ophthalmoscope, a revolutionary new concept for visualizing the fundus. Developed by Welch Allyn® the originator of the world's first hand-held direct illuminating ophthalmoscope, the PanOptic™ incorporates an innovative and patented new optical design called Axial PointSource™ Optics. This enabling technology makes it easier to enter small pupils and provides a dramatically wider, more panoramic view of the fundus that's 5X larger than ever before achieved with a standard ophthalmoscope in an undilated eye. • Patented new Axial PointSource™ Optics. • Illumination system converges the light to a point at the cornea, allowing easy entry into small, undilated pupils. • The illumination pathway then diverges to the retina, illuminating a very wide area of the fundus. • Viewing system enables the operator to view the illuminated area on virtually the same axis, creating the widest field-of-view attainable. • Provides a 5-times larger view of the fundus than ever before achieved with a standard ophthalmoscope in an undilated eye. • Enables a 25-degree field-of-view vs. the standard 5-degree field-of-view. • Increases magnification by 26% over a standard ophthalmoscope. • Patented Glare Extinguishment System prevents interference from unwanted glare and reflections. • New Halogen HPX™ lamp provides bright, white light. 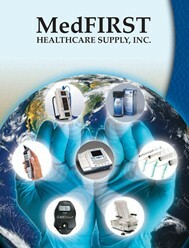 • Greater working distance improves the comfort of both examiner and patient. • Works with all existing Welch Allyn 3.5v power sources (battery handle or wall transformer), saving additional investment. • The patient eyecup establishes and maintains proper viewing distance, provides stabilization for the view, is a pivoting point for leverage in panning around the retina, occludes ambient light, and helps with orientation. • The dynamic focusing wheel adjusts the focus in a continuous, smooth action for more precise control and the optimum view with a focusing range of -20 to +20 diopters. • The aperture dial has micro, small, and large spot sizes, a slit aperture, and red-free filter, and cobalt blue filter with add-on corneal magnifiying lens (Model 11820 only). • The ergonomic design of the built-in, soft grip handle provides maximum comfort, balance, and access to controls.